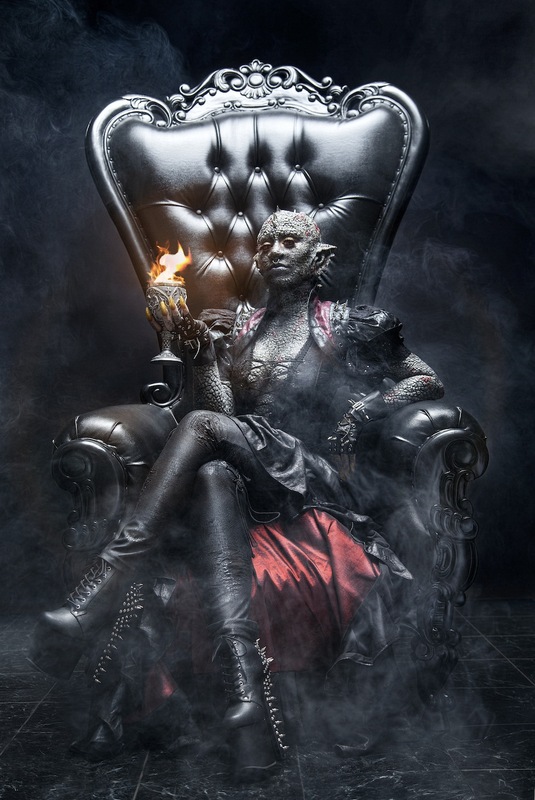 The Dragon Empress was initially created for the 2015 Halloween convention known as ScareL.A. in Pasadena California. It was very well received by attendees and would later garner a best make-up award. The guest judge for this was 2 time Emmy winner Eryn Krueger Mekash. This character consisted of up to 36 prosthetic pieces. The ears, nose tip, cowl, neck and forehead were cast in gelatin. The face, arms and rest of the body was covered using pros-aide transfers which go on like 3 dimensional temporary tattoos. The advantage of this process besides quicker application time was that it provided our model with nearly unlimited movement. These pieces were designed to truly act like a second skin, overlapping in such a way that would not restrict performance. The eyes were initially designed by us and further refined by Cristina Patterson of EyeInk FX, who then created the customized lenses. Dental Distortion provided the teeth and nails. Multiple make-up tests and fittings were done to arrive at the final look. This project also aimed to bring together fashion and prosthetics in a unique way to convey a sense of the mythic in contemporary times. To help us achieve this we collaborated with talented photographer Michelle Monique, who was able to capture some stunning images. This make-up represents 18 years of artistry.